Then he goes on to highlight from his own life how he has shifted through there four 'types' in his own life. Jesse's life is interesting by any standards, hold black belts in two different styles, being a county sheriff at the age of 21. Then drawing from his training and discipline in the martial arts, and as a law enforcement officer, once his faith was challenged he applied his rigor and discipline to his faith. He says: "Paul gave me a Christian tract that said if you are not moving forward spiritually, you are probably moving backward. The world had taught me that he who dies with the most toys wins, but this tract said that he who dies with forgiveness of sins wins. This now totally made sense to me. All the sacramental graces I had received throughout the course of my life were stirring within my soul." But when he was challenged he started pursuing Protestantism. But he was challenged just before leaving the Catholic church by his wife who said: "Before you run off to some other church-or worse yet, start your own-why don't you study Catholicism from Catholic sources? You have had your nose studiously in non-Catholic Christian literature for the past year and a half. If you can prove to yourself that Catholicism is wrong from Catholic sources, then I will respect you if you still want to leave. But first give it a chance." So that is what he did. And his love for the Catholic church grew in ways he could never imagine. Jesse now holds a B.A. in Liberal Arts from Mount St Mary's College in Los Angeles and he also has a Master's Degree in Catholic Theology from Franciscan University of Steubenville in Ohio. 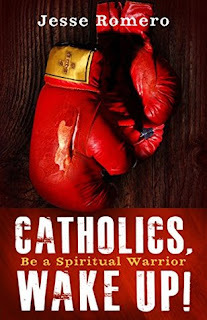 And now he is a Catholic evangelist who speaks at conferences and retreats in English or Spanish about Catholic Evangelization, Topical Bible Studies, Apologetics, Marriage & Family, Spiritual Warfare, Men's topics, Teen topics and Culture War issues that affect all Catholics. And this book is an extension of that ministry. Each chapter in this book follows the same format. It begins with a biblical quote. This is followed by the main teaching and then all chapters except one end with 3 questions for reflection. Only chapter 9 'Called to be a People of Hope' has more than three questions for reflection, it has 10! This whole book is argued from scripture and the Catechism. Every chapter is infused with quotes to underline and reinforce the points that Jesse is speaking to. 1. Do you see yourself playing a role in seeking and saving the lost, or is this something for pastors and missionaries? What part could God be calling you to play? 2. How passionate are you when it comes to your relationship with Jesus Christ? Do you consider him your best friend? 3. Are there any areas of passivity where living your faith is concerned? What might you do to turn those into passion? 1. How deep is the level of your commitment to Christ? How can you increase it? 2. Do you see your body as the temple of the Holy Spirit? What would you do differently if you truly saw yourself this way? 3. What kinds of heroism are you called to in your own family? At work? In your community? As you can see this book will challenge your faith, and how you live it out day by day. Jesse writes with great passion, and he shares many personal stories. His personal stories will challenge and encourage us in our own spiritual growth, obedience and evangelism. This was a great read and I can highly recommend it.